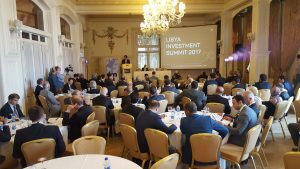 The Libya Investment Summit, Istanbul, 9-11 May (Photo: Sami Zaptia). Khaled Zharrugh, chairman of Libya’s Investment and Real Estate Bank said that he is trying to change his bank so that it can operate as a commercial bank. Zharrugh admitted during a panel discussion on real estate investment in Libya that his bank had to modernize in order to be able to work in modern day Libya. He was speaking on the second day of the Libya Investment Summit being held in Istanbul from 9-11 May. Zharrugh admitted during the question and answer session with conference participants that his state-owned bank had not received any money from the Libyan government for the last four years. It has 37 branches and 1,700 employees – yet has done no new business for at least four years. The bank finances or builds housing that is either sold at subsidized prices or social housing that used to be distributed free to low income families. It has around 20,000 houses under construction that are still incomplete and it is unable to obtain any finance from the currently impoverished Libyan state in order to complete them. Meanwhile, Libya is suffering an acute housing crisis. Zharrugh admitted that his bank is a legacy of the Qaddafi era and that post the 2011 revolution it needs to reassess its role in a modern post-socialist/welfare state Libya. ‘‘We are a legacy of the Qaddafi regime doing social housing. We are looking to change, in order to be able to work with other banks and companies’’. However, he admitted that ‘‘currently they are not permitted to go commercial’’. ‘‘We want to stop (the commercially unsustainable) idea of giving away free housing. We want to become commercial. We have asked the Central Bank of Libya to change our regulations in order to change us to a commercial bank. We want to operate under Islamic Sharia banking laws offering housing to investors’’, he explained. The idea is to be able to implement housing and general real estate projects with both Libyan and foreign investors.